On Wednesday, April 10, Dominic Winter Auctioneers holds a sale of Printed Books & Maps; Travel & Exploration; Geology & Charles Darwin, in 556 lots. A collection of letters from Charles Darwin to his land agent John Higgins rates the top estimate, at £15,000-20,000. Other interesting lots include a complete copy of the Encyclopaedia Londinensis (1810-1829) at £6,000-8,000; a 1636 Mercator Atlas Minor (£5,000-8,000); and a complete run of the Transactions of the Geological Society (1811-1856), estimated at £4,000-6,000. The top estimated fossil is a Tyrannosaurus vertebra, at £1,000-1,500. Also at Dominic Winter, on Thursday, April 11, Vintage Cameras & Photographs; Autographs, Stamps & Ephemera; Bookbinding Equipment & Accessories, in 457 lots. The first seventy lots here include book presses, binding tools, bookcloth, and paper, some of which comes from the workshops of Derek Starkey and John Frederick Cuthbert MBE, the former senior conservator at the Guildhall Library. But it is the Cottingley Fairies photograph lots that are expected to draw the most attention at this sale. These include an original contact print of “Frances and the Fairy Ring” (£10,000-12,000; pictured) and a set of “copyright” prints of all five of the photographs made around 1920 (£10,000-15,000), all from the collection of Frances Wright’s daughter Christine Lynch. An original contact print of “The Fairy Bower” is estimated at £5,000-7,000, and one of “Fairy with a Posy” could fetch £3,000-5,000. And on Friday, April 12 at ALDE in Paris, Atlas - Cartes - Livres de Voyages, in 217 lots. Estimated at €40,000-50,000 is a copy of David Roberts’ The Holy Land (1842-1849) in four volumes. Three lots are each estimated at €15,000-20,000: Jean Houël’s Voyage pittoresque des isles de Sicile, de Malte et de Lipari (1782-1787); Richard de Saint-Non’s Voyage pittoresque ou description des royaumes de Naples et de Sicile (1781-1786); and Jacques Le Hay’s Recueil de cent estampes représentant différentes Nations du Levant (1715). Also at Dominic Winter, on Thursday, April 11, Vintage Cameras & Photographs; Autographs, Stamps & Ephemera; Bookbinding Equipment & Accessories, in 457 lots. The first seventy lots here include book presses, binding tools, bookcloth, and paper, some of which comes from the workshops of Derek Starkey and John Frederick Cuthbert MBE, the former senior conservator at the Guildhall Library. 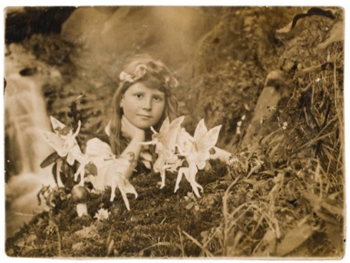 But it is the Cottingley Fairies photograph lots that are expected to draw the most attention at this sale. These include an original contact print of "Frances and the Fairy Ring" (£10,000-12,000; pictured) and a set of "copyright" prints of all five of the photographs made around 1920 (£10,000-15,000), all from the collection of Frances Wright's daughter Christine Lynch. An original contact print of "The Fairy Bower" is estimated at £5,000-7,000, and one of "Fairy with a Posy" could fetch £3,000-5,000. And on Friday, April 12 at ALDE in Paris, Atlas - Cartes - Livres de Voyages, in 217 lots. Estimated at €40,000-50,000 is a copy of David Roberts' The Holy Land (1842-1849) in four volumes. Three lots are each estimated at €15,000-20,000: Jean Houël's Voyage pittoresque des isles de Sicile, de Malte et de Lipari (1782-1787); Richard de Saint-Non's Voyage pittoresque ou description des royaumes de Naples et de Sicile (1781-1786); and Jacques Le Hay's Recueil de cent estampes représentant différentes Nations du Levant (1715).